I have always had a profound love for music since my early childhood, and I have always loved cinema, so when I was very young I felt it was the next step for me to start noticing and appreciating more and more the composers and their different styles and ways of scoring my favorite pictures. Not to list many of them, but my favorite ones were Miklós Rózsa, Jerry Goldsmith, Alfred Newman and James Horner. Their masterworks for Ben Hur, El Cid, Star Trek: The Motion Picture, The Wind and The Lion, How The West Was Won, The Greatest Story Ever Told, Krull, and Star Trek II The Wrath of Khan pointed me in the direction of becoming a film music enthusiast and later on, to collaborate in different publications in my home town, always with music and film music at close range. After a few publications in the Spanish film music magazine Rosebud, I met a magnificent group of people attending The Lord of the Rings Symphony concert event conducted by Howard Shore in Seville, back in October 2004, and although we did not know it at that point, that very moment changed our life. That reunion of film music lovers, of fans of every corner of Spain, created a seed that in less than 12 months would culminate in the first International Film Music Festival in the city of Úbeda – or, as we used to call it in praise of one of our most beloved films and scores, “The Place Where Dreams Come True,” a mythic line of dialogue from Field of Dreams. After Úbeda, where a sense of brotherhood and friendship between attendants was born (which we called “The Spirit of Úbeda”) a new festival called Playfest was created, to expand the festival and focus on the music of the video games industry. After that Córdoba took the baton, and after that Málaga, where since 2016 MOSMA (MOvie Score MAlaga) has been celebrated. Through many years of collaborating, helping, and attending all these events, there are many names to remember, from the late Basil Poledouris, to Bruce Broughton, David Arnold, John Debney, John Powell, Patrick Doyle, Michael Giacchino, John Ottman, Rachel Portman, John Scott, Roque Baños, Philippe Rombi, Chris Lennertz, Murray Gold, Blake Neely, Mark Isham, Christopher Young, and Jan A.P. Kaczmarek to name just a few. Many memories, panels, concerts, gatherings, celebrations, and a lot of work, but a work of joy, fulfilling great dreams that felt almost impossible a few years back, a work of love which filled us and fills us still today with gratitude and endless passion every summer for the last thirteen years. 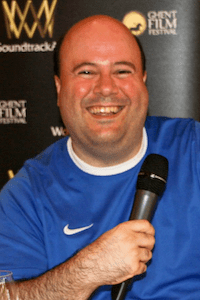 As I pointed out previously, that meeting in Seville was the definitive starting point for me to enter the world of film music journalism, as I became a part of the Spanish film music website www.bsospirit.com. I received a gentle invitation to collaborate just after that wonderful and historic for us gathering at Seville, and since then I have written hundreds of reviews, studies and interviews, with one clear, sincere and honest intention: to help the family of film music in Spain, first and then the international one of course, to become bigger and bigger, and I humbly believe we are achieving that goal, every day. I have collaborated as well with other film music webitess through the years, like the wonderful http://jameshorner-filmmusic.com/, thanks to the kind spirit of Jean-Baptiste Martin, who always has been very supportive and generous to work with. There is also the recent addition to the film music cyberspace in Spain, SoundTrackFest, where its creator, Gorka Oteiza, and I have worked together recently on an all new interview with the Grammy Awarded and renowned recording engineer Mikel F. Krutzaga. Well, that’s a tricky question, because nowadays I find that a lot of scores are not successful artistically but they are having a lot of praise commercially and in some cases even critically, so I think it is a fixation what producers and directors are looking for now to sell the film in the trend of recent successful previous films instead of letting the musicians to thrive and fight for a new voice composing a unique creatively and fresh stylistically new score to really surprise the audience in the best way possible. Today, surprises seem to be forbidden as opposed to follow the path of who is selling the beans instead of providing the seeds for new discoveries and fresh tones. This is referring mainly to Hollywood blockbusters and a huge part (not all) of recent American cinema, because there are extraordinary composers and fantastic scores every year that are pure jewels coming from another less renowned cinematographies. And without a doubt, out of the obvious film circuits there are new voices, for instance in new grounds like video games or TV. In my humble opinion, the work of composers is too much influenced for the tyranny of temp tracks, every day more, and this is not the best terrain for creativity, when you need to follow a marked path instead of letting your talent glow, serving the film but without attachments to pre-existing materials. So, for me, the best works are found when the collaboration between creative forces is not limited or narrowed by what was cool the previous month. And with this, I am not saying this was not happening twenty years ago, but certainly it was not happening at the levels it is going on today. And when all clicks, good collaborations based on trust and freedom DO deliver, and it certainly pays off big time. Summing-up, a good score defines the film, gives it its voice and enriches the artistic palette of the storytelling; music provides counterpoint, fluidity, understanding of the narration and the characters, and involves sub-levels of depth, and when all that is achieved without manipulation, simply being a second skin with the film, is when the goal is reached. I must confess that, in my case, I am a melody kind of guy, when a score touches all the right buttons and makes me feel something, I am sold! If I feel it is fresh and not a copycat of some kind it gets me convinced pretty quickly when I notice the effort behind the wheels. For me that’s the true success. What is your opinion of the film music industry as it stands today, especially in Spain? In the particular case of my country, I’m pretty optimistic I have to say. Spain has a stunning new generation of composers, with a background to be envious about, and every day they are better considered by producers and directors, a thing that not always happened in the past. You can feel this appreciation to the labor of composers and their artistic process everywhere here, in most of the cases receiving bigger budgets and possibilities to let them grow and became as great as they deserve. It is undeniable that the new voices of Alberto Iglesias, Roque Baños, Pascal Gaigne, Fernando Velázquez, Javier Navarrete, Arnau Bataller, or Federico Jusid to name a small number of them, are receiving deserved international praise and appreciation and that’s a wonderful thing to witness. They are paving the way for a new generation of new voices to feel safe about their future and possibilities, which is clearly something to be very optimistic about. In terms of film music around the world, I am truly hoping that melodies and thematic writing are back and droning, atmospheres and sound design are losing the terrain, but this is uncertain at this point. Every day it is more difficult to find new symphonic orchestral works to blow our minds away (they still exist of course, but less than decades ago), and more un-thematic works are being released and developed, with is discouraging when suddenly you feel that in one month you have not discovered something new that took your breath away. Maybe, I am getting too picky, you know? I am still hopeful though. Ok, if we separate the ages, like it is usually done, from the Golden (and best) Age of Film Music it is extremely difficult to choose a top five, but here it is mine: Miklós Rózsa (simply the greatest film music composer ever in my honest and humble opinion), Alfred Newman, Bernard Herrmann, Dimitri Tiomkin, and Erich Wolfgang Korngold. From the Silver Age my top five would be equally remarkable too: Jerry Goldsmith, Elmer Bernstein (who could be perfectly in the Golden Age list too such is his astounding career and immense talent), John Barry, John Williams and George Delerue. And finally, talking about other composers who are in my heart through their groundbreaking careers full of legendary music, I must say that James Horner, Basil Poledouris, Christopher Young, Bruce Broughton and James Newton Howard, among many others, have a piece of my heart. I fell in eternal love with their musical legacy many years ago. Nevertheless, if I have to choose three, my decision is clear. First, Miklós Rózsa, whose symphonic wonderment, rich textures and wondrous orchestrations, epicness, and intimacy elevated music to biblical levels. Second, Jerry Goldsmith, who had supernatural greatness and a gift for unforgettable melodies and themes that become part of you from the very second you listen to them for the first time. Goldsmith is also probably the most underappreciated composer in the awards seasons, and one of the most deserving of appraisal. Finally, James Horner, whose music reaches my heart and soul at once like no other. The emotions I feel listening to his remarkable scores are unparallelled, he was a true giant, a kind spirit in search for the glory of reaching the perfect melody to help narrate the perfect story, he succeeded in every step of the way, and in my heart I can’t be more thankful for having lived in the times of James Horner. There is no goodbye, only love.